If you just wake up everyday, go to work and cari makan, that’s your preoccupation and you don’t think about other things. Reading a book could help you think about other things. It should be entertaining, but it should also help you think about things. Two months from now (hopefully) I would be in a wooden lounge chair, sipping a freshly brewed fragrant Balinese coffee, hands busy scribbling on my Moleskine, brimming with ideas and inspiration from world's most prolific writers. Ubud's soulful breeze would be caressing my hair and love for words would be my intimate companion apart from the fellow book lovers and brilliant writers. 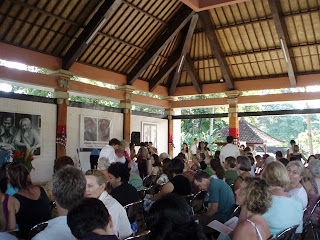 2010 Ubud Writers and Readers Festival will take place on 6-10 October.